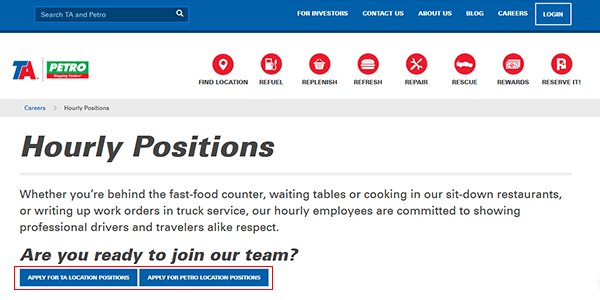 The Petro Stopping Centers job application is available on the company’s careers website. Follow the links posted on this page to access the application. Several different types of careers can be searched/applied for (including both retail as well as management roles). Read the instructional guide posted below to learn more about the online job search and application processes. 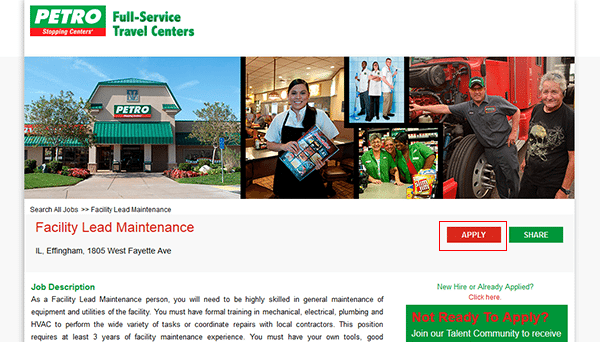 About the Company: Petro Stopping Centers is an American chain of fuel, maintenance, and convenience centers headquartered out of Westlake, Ohio. 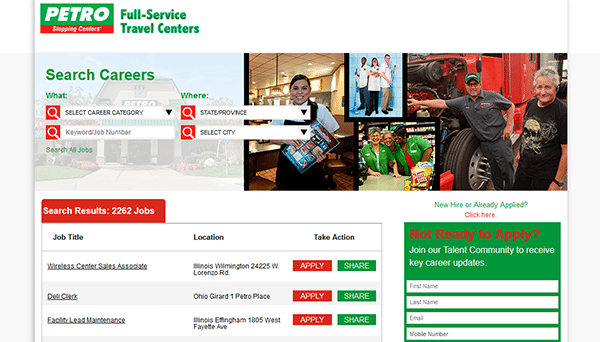 The company also operates under the TravelCenters of America brand. There are more than 200 locations throughout the United States. TA and Petro Stopping Centers was founded in 1972 by Phil Saunders. Step 1 – Copy and paste the following link into a new window/tab within your current internet browser (and then open the page). Step 2 – Scroll down the page and click the link that corresponds to the type of career that you’re interested in (e.g. hourly or management). Note: These instructions provide an overview of the online job search process for hourly positions. Step 3 – Press the “Petro Locations” button. Step 5 – Press the title link of the job that you’re interested in applying for. Step 6 – Read the job description and then hit the button as outlined below. Step 7 – Click the “Start Here” button if you’re a new user. If you already have an account sign in to it.